FC Halifax Town secured their play-off place in style with a comprehensive 3-0 win over Curzon Ashton at The Shay. An own goal and Dion Charles’ header were added to after the restart by Danny Hone as Halifax swept aside a Curzon team who were outplayed from start to finish and only did just about enough to be second best. 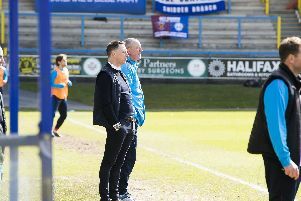 The Shaymen had too much quality for the visitors and won at a canter; they are the form team heading into the play-offs and could still finish second if they win and Kidderminster lose on the final day. If not, a draw at Chorley will guarantee third place. Town bossed the game from the start, with Charles spurning a great early chance when he raced through one-on-one but struck his low shot straight at goalkeeper Hakan Burton. Ryan Hall’s prod towards goal hit Sam Johnson after he latched onto a through ball, but that was already against the run of play after only 15 minutes. Charles, Matty Kosylo and Jordan Sinnott - so effective against Harrogate last time out - were all given too much time and space on the ball by a relaxed Curzon team, who conceded possession too cheaply and didn’t attack with enough urgency. Town looked determined to seal their play-off place as soon as possible, playing with purpose and pace. And although there was a slice of luck to Halifax’s opener, it came after a sumptuous cross-field pass by Sinnott to Kevin Roberts, who controlled the ball superbly before his low cross was turned in by a Curzon man, possibly Chris Rowney. Nathan Hotte nearly added a second soon afterwards but Burton reacted well to tip over his volley from Sinnott’s corner. Charles again wasted a good chance to score when he got in the way of Richard Peniket’s goalbound shot before failing to convert from no more than two yards out in-front of two Curzon defenders on the line. But he made no mistake when he nodded Kosylo’s deep cross into the roof of the net at the far post; if Town are to go up, the Charles-Sinnott-Kosylo axis looks set to play a key role, with Charles particularly eye-catching, adding aggression and tenacity to his undoubted skill on the ball. Sinnott continues to impress with his vision and range of passing, while Kosylo’s adeptness at running with the ball at pace offers a nice balance to the similarly-blessed Charles on the opposite flank. Curzon already looked a beaten team having made a fist of staying in the contest at 1-0 down, with Luke Clarke’s sloppy pass nearly leading to a third just before the break when it let in Kosylo, but his low shot was turned round the post by Burton. Curzon produced something of a response after the interval, with efforts from Matt Warburton and Ryan Jennings, but it was still half-hearted, with Town’s lead never under serious threat. And the result was sealed when Hone, who replaced injury-victim Scott Garner, prodded home the loose ball after a corner had bobbled around the box. Adam Morgan was denied a fourth against his old club by Burton’s superb reaction save before he also kept out Danny Clarke’s effort on the rebound. Halifax: Johnson, Roberts, Hone, Hotte, Wilde, Kosylo (Denton 64), Lynch, Sinnott, Clarke, Charles (McManus 57), Peniket (Morgan 73). Subs not used: Drench, Brown. Curzon Ashton: Burton, Baillie, Shaw, Clarke (Thornley 46), Guest, Wright, Hunt, Rowney, Jennings (McKenzie 85), Warburton, Hall. Subs not used: Brown, Cummins, Ennis.